One of the more puzzling mysteries of 9-11 is what ever happened to the flight recorders of the two planes that hit the World Trade Center towers. Now it appears that they may not be missing at all. Counterpunch has learned that the FBI has them. 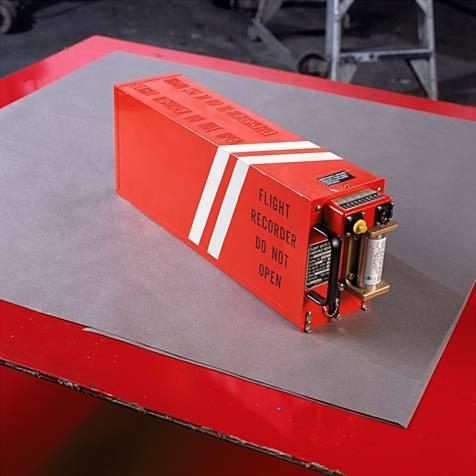 Flight recorders (commonly known as black boxes, though these days they are generally bright orange) are required on all passenger planes. There are always two-a flight data recorder that keeps track of a plane’s speed, altitude, course and maneuvers, and a cockpit voice recorder which keeps a continuous record of the last 30 minutes of conversation inside a plane’s cockpit. These devices are constructed to be extremely durable, and are installed in a plane’s tail section, where they are least likely suffer damaged on impact. They are designed to withstand up to 30 minutes of 1800-degree heat (more than they would have faced in the twin towers crashes), and to survive a crash at full speed into the ground. All four of the devices were recovered from the two planes that hit the Pentagon and that crashed in rural Pennsylvania. In the case of American Airlines Flight 77, which hit the Pentagon, the FBI reports that the flight data recorder survived and had recoverable information, but the voice recorder was allegedly too damaged to provide any record. In the case of United Airlines Flight 93, which hit the ground at 500 mph in Pennsylvania, the situation was reversed: the voice recorder survived but the flight data box was allegedly damaged beyond recovery. But the FBI states, and also reported to the 9-11 Commission, that none of the recording devices from the two planes that hit the World Trade Center were ever recovered. Now there is stronger evidence that something is amiss than simply the alleged non-recovery of all four of those boxes. A source at the National Transportation Safety Board, the agency that has the task of deciphering the date from the black boxes retrieved from crash sites-including those that are being handled as crimes and fall under the jurisdiction of the FBI-says the boxes were in fact recovered and were analyzed by the NTSB. The official word from the NTSB is that the WTC crash site black boxes never turned up. “No recorders were recovered from the World Trade Center,” says the NTSB’s Lopatkiewicz. “At least none were delivered to us by the FBI.”; He adds that the agency has “always had a good relationship” with the FBI and that in all prior crime-related crashes or flight incidents, they have brought the boxes to the NTSB for analysis. For its part, the FBI is still denying everything, though with curious bit of linguistic wiggle room. “To the best of my knowledge, the flight recording devices from the World Trade Center crashes were never recovered. At least we never had them,” says FBI spokesman Stephen Kodak. What the apparent existence of the black boxes in government hands means is unclear. If the information in those boxes is recoverable, or if, as is likely, it has been recovered already, it could give crucial evidence regarding the skill of the hijacker/pilots, perhaps of their strategy, of whether they were getting outside help in guiding them to their targets, of how fast they were flying and a host of other things. Why would the main intelligence and law enforcement arm of the U.S. government want to hide from the public not just the available information about the two hijacked flights that provided the motivation and justification for the nation’s “War on Terror” and for its two wars against Afghanistan and Iraq, but even the fact that it has the devices which could contain that information? Conspiracy theories abound, with some claiming the planes were actually pilotless military aircraft, or that they had little or nothing to do with the building collapses. The easiest way to quash such rumors and such fevered thinking would be openness. Instead we have the opposite: a dark secrecy that invites many questions regarding the potentially embarrassing or perhaps even sinister information that might be on those tapes. Dave Lindorff is the author of Killing Time: an Investigation into the Death Row Case of Mumia Abu-Jamal. His new book of CounterPunch columns titled “This Can’t be Happening!” is published by Common Courage Press. Information about both books and other work by Lindorff can be found at www.thiscantbehappening.net.